Residents of Venezuela have been treated to a light show that has been going on for thousands of years. One spot on the Catatumbo River gets, regularly, forty thousand bolts every night. The lightning has helped sailors navigate, foiled attacks on the nearby countryside, and is actually responsible for Venezuelan independence. Find out about the most zapped spot on earth. Roughly three hundred nights a year, the residents on Lake Maracaibo need to shut their blinds against the light. Each of the individual storms over the Catatumbo River are no different from lightning storms everywhere else. But with the concentration on that one spot, and the fact that the lightning comes back day after day, ten months out of every year, things start to get weird. Theories abound as to why the lightning is concentrated in one area all the time. Some scientists say that the geological features around the Catatumbo River basin contribute to a constant low-pressure system. That would explain why the lightning hasn't stopped for more that a few months at a time for thousands of years. Weather or humidity might play a part — since the longest recorded pause for the lightning happened in 2010, an El Nino year that ushered in a terrible drought in Venezuela. Some say the months-long disappearance of the visible lightning was actually due to deforestation and agricultural development in the region around Catatumbo. The constant lightning storms are part of the history of the region. Believe it or not, they help the region become a reliable port, since the giant bolts of lightning are excellent navigational aids for sailors. They just aren't aids for stealthy sailors. It was said that an attack on Lake Maracaibo by Sr Francis Drake was foiled because the lightning lit up the sky enough for people to spot his ships. Later, in the 1800s, it is said to have guided Admiral José Prudencio Padilla to a battle, which turned into an important victory for Venezuelan independence. The loss of the lightning, due to drought, deforestation, or El Nino conditions, may be a loss for local beauty and natural historic preservation — but it could have been a boon for the environment. 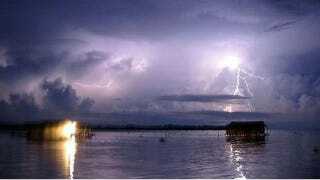 The constant barrage of lightning over Lake Maracaibo helps replenish the ozone layer. Oxygen usually binds with other elements, or forms pairs with another oxygen molecule. Ozone is three different oxygen molecules bound together, which rarely happens. This is lucky for us, because ozone is poisonous. When it's up in the ozone layer it's an ecological benefit, blocking ultraviolet rays. When it's swimming around the rest of the atmosphere, it's a greenhouse gas. Lightning doesn't directly make ozone, but its high heat and pressure force oxygen to combine with another chemical it doesn't usually hook up with; nitrogen. When nitrogen atoms are bound to oxygen atoms, it's only a temporary partnership. Sunlight shakes them loose, and the extra oxygen often finds a pair of oxygen atoms to connect with. Via ABC, WonderMondo, and The Guardian.